Researchers track mountain lion movements with trail cameras and radio collars. Results show some lions were mere feet away from people who were unaware of the lion’s presence. No aggressive lion behaviors were ever reported to the researchers or park personnel during the studies (U.C. Davis Wildlife Health Center photo). Answer: Your question relays a deep concern for local residents’ well-being, and DFG shares your concern. To directly answer your question about taking proactive steps, DFG’s Statewide Bear, Mountain Lion and Wild Pig Programs Coordinator Marc Kenyon explains that the department is bound by existing laws. In 1990, California voters passed Proposition 117, an initiative that made it illegal to kill mountain lions except to prevent livestock losses or ensure public safety. DFG does not consider mountain lion sightings near human habitation a public safety concern as long as the lion is not exhibiting aggressive behavior towards people. Mountain lions occur most anywhere you can find their primary prey, which is deer. As you likely know, deer not only live in remote forests, but also in green belts, parkways and riparian corridors along rivers. As such, mountain lion sightings in these areas are not uncommon, and DFG receives numerous reports of lions in these settings every month. Mountain lions are considered beneficial in these settings as they maintain healthy deer herds by keeping their populations in check. DFG has scientific evidence that mountain lions inhabiting areas close to humans are no real cause for concern. We have either conducted or been associated with mountain lion studies that have monitored their movements in such areas. We typically capture mountain lions and place a radio collar on them in order to track their movements. The information gleaned from these collars has provided some illuminating results. They have indicated that mountain lions regularly use such areas more frequently than we have previously thought, and that these lions generally attempt to stay away from people. 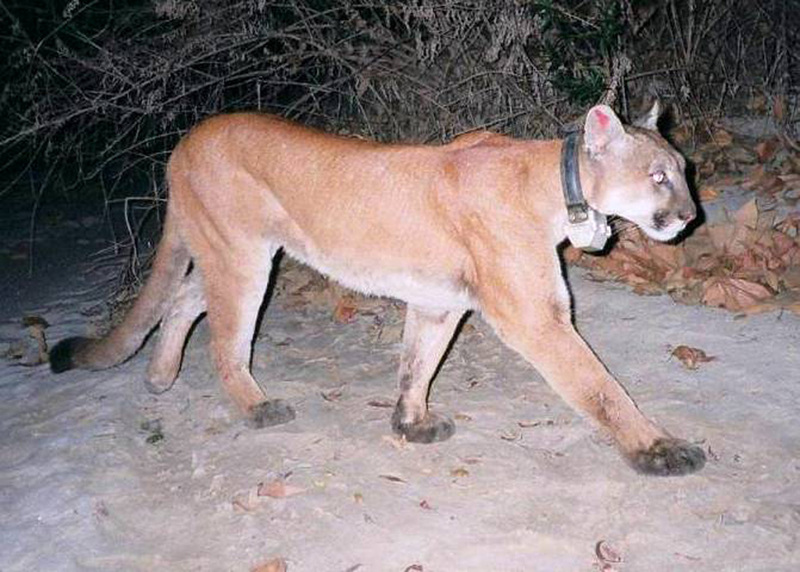 For example, in Southern California, university researchers have placed collars on these big cats in a heavily used park. They also placed trail loggers and remotely triggered cameras along popular trails to estimate human use. Surprisingly, the results indicated that some lions were mere feet away from people who were unaware of the lion’s presence. During the course of this study, no reports of aggressive lion behaviors were ever reported to the researchers or park personnel. In rare instances, mountain lions will attack and injure or kill people. We have policies and procedures in place that guide our response in such unfortunate cases. Our policy directs us to care for the victim and locate and kill the offending animal in any manner possible. You are correct that this is a reactive approach, but we are bound by the law. We attempt to mitigate such situations by continually informing the public about how to appropriately live and recreate in mountain lion habitat. The information presented in our Keep Me Wild Campaign (www.dfg.ca.gov/keepmewild/lion.html) and on our mountain lion website (www.dfg.ca.gov/news/issues/lion/) is designed to help meet this purpose. I hope that you visit these websites and help us in this effort by educating your friends, family and neighbors about the proactive steps to ensure their safety in lion country. Salmon heads as bait in Dungeness crab traps? Answer: California Fish and Game law does not specifically prohibit using the pieces and parts of salmon in crab traps as long as the salmon were otherwise legally taken, landed and/or acquired. Salmon not taken in accordance with these laws (e.g., size limits, seasons, species, etc.) are illegal to possess and use for any purpose. Helping friends fill their tags? Answer: Once a hunter takes a deer and fills his tag, he may accompany other hunters but cannot assist them in any way in the take of additional deer. In addition, he should leave his rifle behind. Otherwise, if encountered in the field with a rifle or other method of take, game wardens may determine the person assisting the hunters is also actively hunting. This entry was posted in Big Game, crabs, Hunting, Uncategorized, Wildlife Encounters, Wildlife Management and tagged baiting, big game hunting, crab fishing, crustaceans, regulations. Bookmark the permalink.